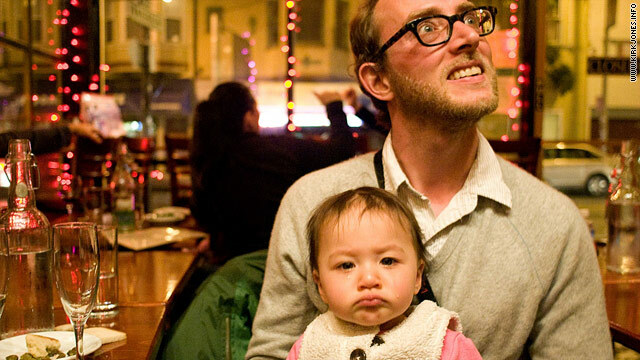 Matt Gross, and his daughter Sasha, like a good bar -- and not just in Brooklyn. Here they visit one in San Francisco, California. Dad says he's "not knocking back double vodkas while my daughter is stumbling around"
(CNN) -- From time to time, Sasha Raven Gross can be seen teetering around a neighborhood drinking hole. She flirts with strangers, talks gibberish and sometimes spins in circles for no apparent reason until she falls down. In one hand is her liquid of choice -- watered-down orange juice in a sippy cup. The 14-month-old toddler is the sort of barfly who's at the center of a recurring and heated debate: Should parents be allowed to bring their babies and children to bars? It is a question in Brooklyn, New York, that's fired up online arguments, prompted unofficial protests and made outsiders giggle. And while the issue may not be exclusive to that area, it's the stuff disputes are made of in what Sasha's dad, Matt Gross, calls the kid-heavy "greater stroller zone" of Park Slope and its surrounding neighborhoods. Single hipsters and others without (and sometimes with) kids complain about being asked to watch their language, to not smoke outdoors near strollers and to keep their drunk friends under control so as not to scare the little ones. They don't want to feel pressure to play peekaboo. They want to cry over their beers, they say, without having an infant drown them out. If anyone is spitting up, they want it to be them. "I will get up on the subway for kids. I will be tolerant of them kicking the back of my seat while seeing a G-rated movie. But let me have my bars," said Julieanne Smolinski, 26, who feels guilty sucking down suds in front of staring 5-year-olds. The adults who bring their offspring to bars, she suggests, are "clinging to their youth." Parents, on the other hand, say that as long as they're responsible and their kids behave, they deserve the right to grab a quick drink with friends. And, they might add, in a place like New York -- where the cost of baby sitters can be prohibitive and tight living quarters can make hosting guests at home difficult -- they need places to hang out, too. "As a stay-at-home dad, it can be kind of isolating. Bars, as much as they're places to drink, they're places to socialize and meet people," said Gross, 35, a freelance writer, an editor for the blog DadWagon and the columnist behind the Frugal Traveler in The New York Times. "I long for adult contact. ... I don't want to be excluded from the adult world." But the divide remains wide in the blogosphere. Around 150 readers weighed in recently when someone posted on the Brooklynian, a neighborhood blog, the simple query: "Which bars are child free?" One writer shared the tale of a drunk father standing at a bar while his beer sloshed on his stroller-strapped kid's face. Another poster announced a bar crawl in which "no crawlers" would be allowed. The public debate about babies in bars ignited about two years ago when the bar Union Hall, a popular stomping ground, banned strollers from the premises, Gross said. "At a certain point, owners said, 'Hey, enough,' " he explained. "Strollers take up a lot of room, especially the nice strollers. Your average Bugaboo is a beast." This ban on buggies in a neighborhood where "kids rule" caused an "uproar," said Erica Reitman, the 36-year-old married -- but not a "breeder," she insists -- marketing director who is behind the blog F****ed in Park Slope. "There wasn't a march on the street, but there could have been. [Union Hall] relented under pressure and got rid of the policy." The owner of Union Hall would not talk to CNN, but an unnamed bartender -- who mentioned the bar had been issued tickets by the fire department at one point because strollers blocked exits -- confirmed that there is no such policy in place. In a part of the city where Greg Curley says he sees "a sense of entitlement on both sides," and where people don't hold back their opinions -- "This is Brooklyn," he said -- he and his partners at The Double Windsor instituted a no-kids-after-5 p.m. rule. "We're a neighborhood gathering place, not a hard-drinking bar, and we're not jerks about it" said Curley, a co-owner and the general manager. "But the overwhelming clientele that spends quite a lot of money here can't deal with babies." Rules like this, simple compromises, don't bother Gross as they might other parents. He's not interested in taking Sasha out till all hours of the night anyway. But when he gets a little stir-crazy in their apartment, he likes to head out to grab a stout with his little girl. He's not taking her to punk dive bars where the music is loud, fights break out and patrons make out or pass out. They gravitate to mellow hangouts, and only in the late afternoon or early evening. "I'm not going to keep her out past 7 p.m. When the bar starts filling up, that's when we head home," he said. "It's responsible parenting and responsible adult behavior. I'm not knocking back double vodkas while my daughter is stumbling around."